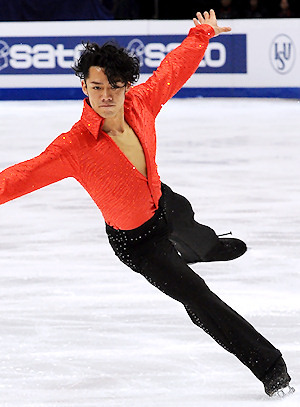 Japan's Daisuke Takahashi took the lead in the short program with his tango to music by Prado at the 2011 Four Continents Figure Skating Championships. Daisuke Takahashi of Japan put out an excellent performance to earn a strong lead in the Men’s Short Program at the 2011 ISU Four Continents Figure Skating Championships on Friday. USA’s Jeremy Abbott and Yuzuru Hanyu of Japan finished second and third. Takahashi was on in his Latin program. He not only nailed the jumps: triple flip-triple toe, triple Axel and triple Lutz, but also got a level four on two spins. The footwork certainly was a highlight of the performance as the reigning World Champion felt every beat of the music and really danced. He was obviously was enjoying himself, and achieved a new season’s best of 83.49 points. Abbott appeared shaky in his Viejos Aires routine. He landed the same jumps as Takahashi, but there were a few slips in the performance and he struggled with the flying upright spin that merited only a level one. The two-time U.S. Champion scored 76.73 points. Coming to Four Continents wasn’t easy for Abbott after losing his National title last month and being left off the U.S. World team. World Junior Champion Hanyu upset the more experienced competitors and produced a triple Axel, triple Lutz-triple toe and two level-four spins to score 76.43 points. However, he came dangerously close to the boards on his triple flip for which he received an edge call. USA’s Adam Rippon missed his triple Axel, but landed a triple flip-triple toe combination as well as his “Rippon” Lutz with both arms over his head. The defending champion sits in fourth place at 72.71 points. Teammate Armin Mahbanoozadeh is sitting in fifth with 66.40 points. He put out a seemingly clean performance with a triple flip-triple toe, triple Axel and triple flip, but the Technical Panel deemed his Axel as underrotated. Both Mahbanoozadeh and his coach Priscilla Hill were shocked to find out about that. Japanese Champion Takahiko Kozuka came in as one of the top contenders to Taipei, but he didn’t meet the expectations. The 21-year-old didn’t add the triple toe to the triple Lutz for his combination and stumbled out of his triple Axel, putting both hands on the ice. He is ranked sixth with 66.25 points. Kozuka didn’t look at the top of his game in practice either and admitted that readily. Shawn Sawyer of Canada is currently seventh (65.71). He doubled his opening triple Axel and two-footed an underrotated triple Lutz. Teammate Kevin Reynolds was the only skater to go for a quad – two of them. While he hit the quad Salchow-triple toe combination, he fell and under-rotated the quad toe as well as the triple Axel. The Canadian is currently ranked 8th (65.47 points). Jinlin Guan of China finished 9th with a clean performance, however, it lacked a triple Axel.